Material: High-endurance Stainless Steel 304 alloy for rust, corrosion and stain resistance. 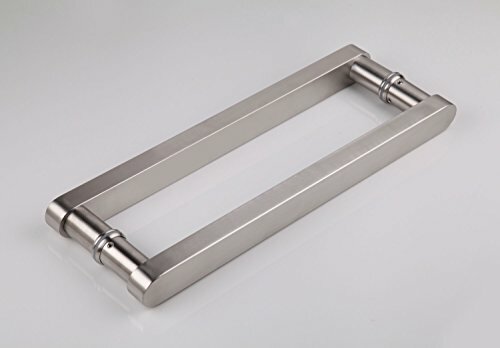 Door Type: Mountable on all types of doors including but not limited to glass and wooden doors.3 pairs of mounting bolts provided for different door types - (34 or 43mm), 84mm & 120mm for mounting to up to 3.2 inches door thickness. Instructions: Preferable but not necessary for the door handle with the set screw to be installed on the inside of the building. Drill and create two thruholes on the door with a Center-to-Center Mounting Distance as specified above. For glass doors, use the ~34mm or 43mm bolts provided. For wooden doors, use the longer ~84 or 120 mm bolts provided. (Installation instructions are provided as guidance only. These door handles can be mounted in different ways using different methods. TOGU Door Handle/Pull works for up to ~3.2" thick wooden/glass doors. All accessories (Allen wrench, spare set screws, 3 pairs bolts) included.